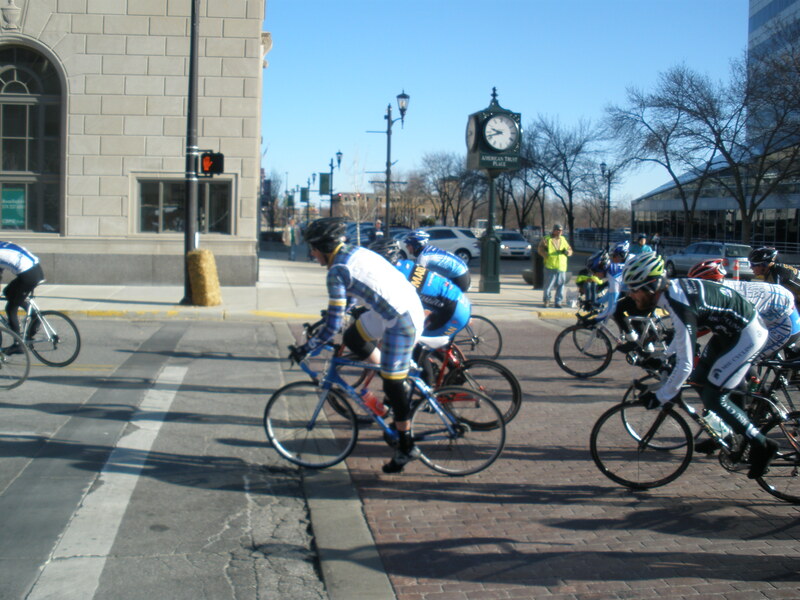 Defiance, St Charles, MO –Located in historic St. Charles on the banks of the Missouri River, Lindenwood University played host to the 2011 MWCCC conference road championships. Notre Dame entered the event looking to defend leads in both the team rankings as well as the individual men’s and women’s categories. 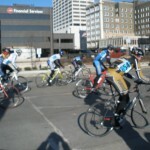 Saturday’s road race featured a 20 mile course through vineyards and river valleys with 3 major climbs per 20 mile lap. 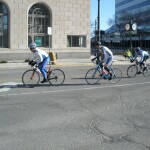 In Men’s A, Joe Magro, Brian Boyle, and Douglas Ansel, rode for the Irish in the 84 mile event. With the first climb only 3 miles into the race, the pace was fast from the gun as riders jocked to start the climb in front. Magro crested the summit in a small group of the conference elite who would ultimately decide the winner amongst themselves. 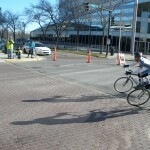 40 miles into the race, Magro’s group had shrunk to 15 and 60 miles in only 12 remained. After 4 hours of racing, Magro finished in 7th place, increasing his lead in the men’s individual standings. 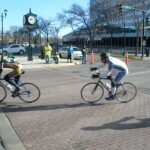 Only 23 of the 50 entrants finished the entire distance. Much like the men’s race, the women’s A field shattered on the first climb with Jenn Perricone from ND sitting comfortably in the lead group. As more and more women dropped back, Perricone held her ground and continued her streak of top 10’s with an 8th place on the day. 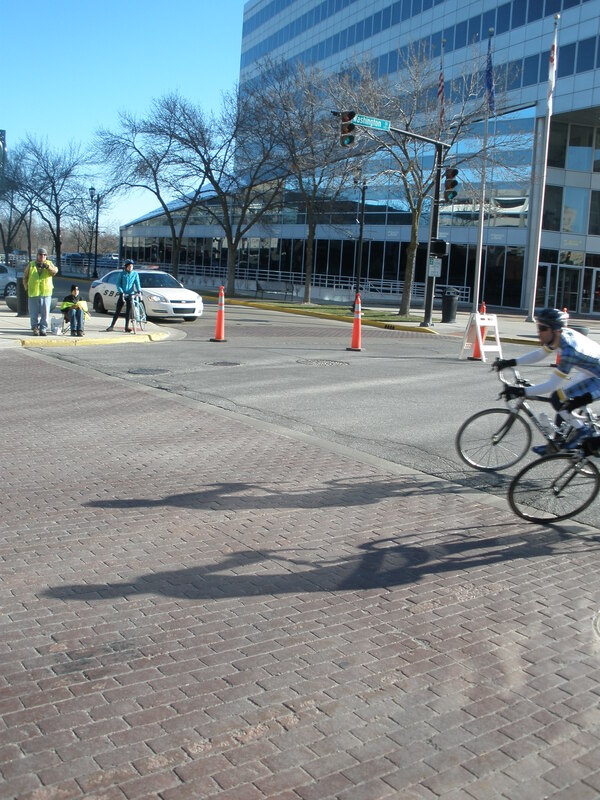 Sunday’s Criterium, held in downtown St. Charles, was the fastest Men’s A race of the year with an average speed of 29mph. A field of 45 was cut to under 30 in only 10 minutes as Boyle and Magro settled into the main field. Keeping the second place individually ranked rider in his sights, Magro rode to preserve the season title while Boyle moved up in the field following multiple attacks. With 3 laps to go Magro sprinted off the front but was soon reeled in by the group. Boyle finished 5th in the field sprint, good enough for 14th overall while Magro cruised in top 20 and claimed the 2011 Men’s Individual Conference Championship. Perricone was riding one of her strongest races of the season in Women’s A before running over a staple in the road with less than 5 laps to go. The tire ruined, she used a spare wheel to finish the race in 14th place which was enough to maintain her lead and take the Individual Women’s Conference Championship. Notre Dame also won the Team Conference Title for the 2011 season. This is the first time in the program’s history that both individual titles, and the team title, all belong to the Irish, Perricone, Magro, Boyle, and Ansel will all compete for the National Championship in Madison, WI the first weekend of May. 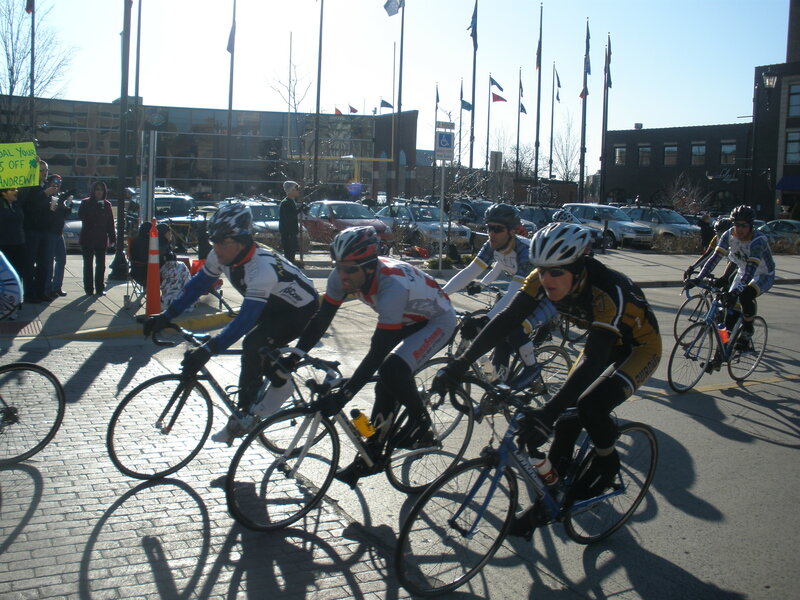 Indianapolis/ West Lafayette – Five ND riders the trip to Indianapolis Saturday for a race hosted by Marian University. 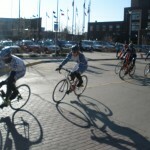 The criterium course wound through Marian’s campus starting in front of the main building. 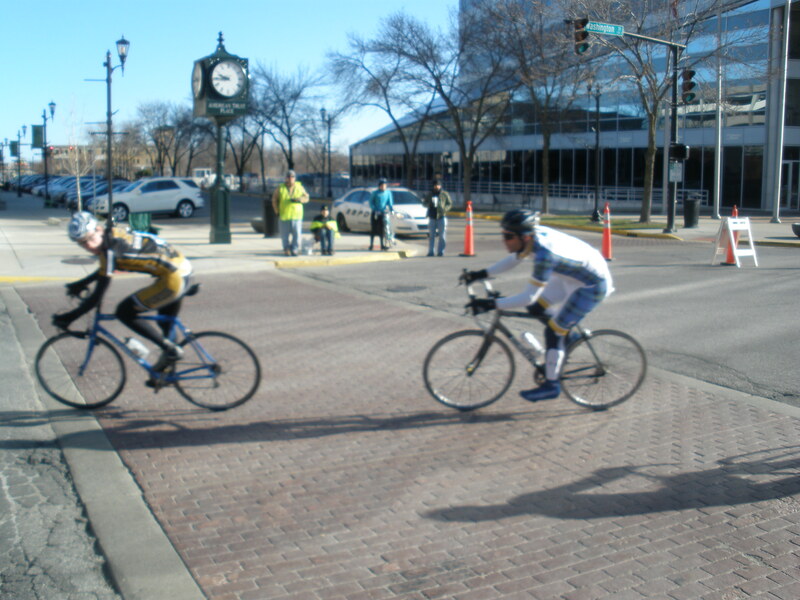 Josh Corcoran and Andrew O’Donnell raced in men’s C and both crashed out before the finish. O’Donnell was set to finish on the podium for the second week in a row before getting collected in an accident 50m from the line. 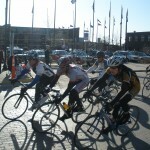 Jenn Perricone had a strong race in Women’s A and finished 3rd. Brian Boyle and Joe Magro ended the afternoon for ND in Men’s A. Magro narrowly avoided crashing into a cone 200m from the finish and had to settle for 21st place. 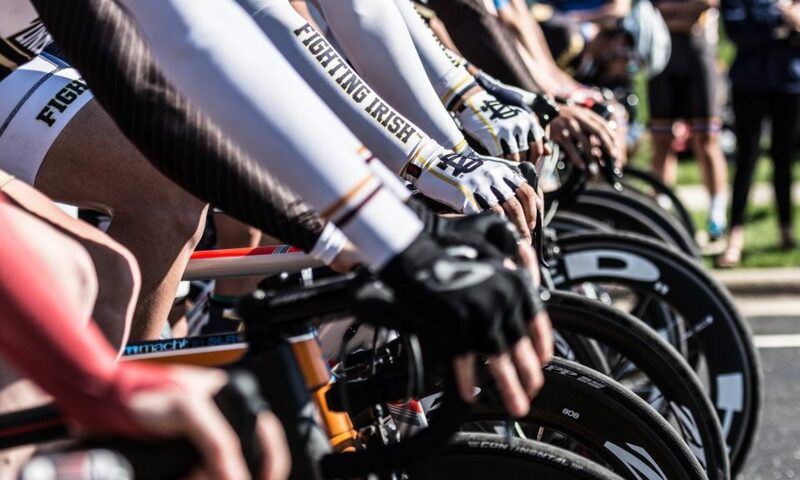 On Sunday, injuries to a number of ND A riders forced the team to start Corcoran and O’Donnell in the team time trial where the ND managed a respectable 8th place result. In the C RR that afternoon O’Donnell continued his recent string of strong showings with a 6th place on Purdue’s challenging circuit. Corcoran also recorded a career best 13th. Perricone again impressed in women’s A riding the majority of the race in an elite breakaway and again finishing in 3rd position. 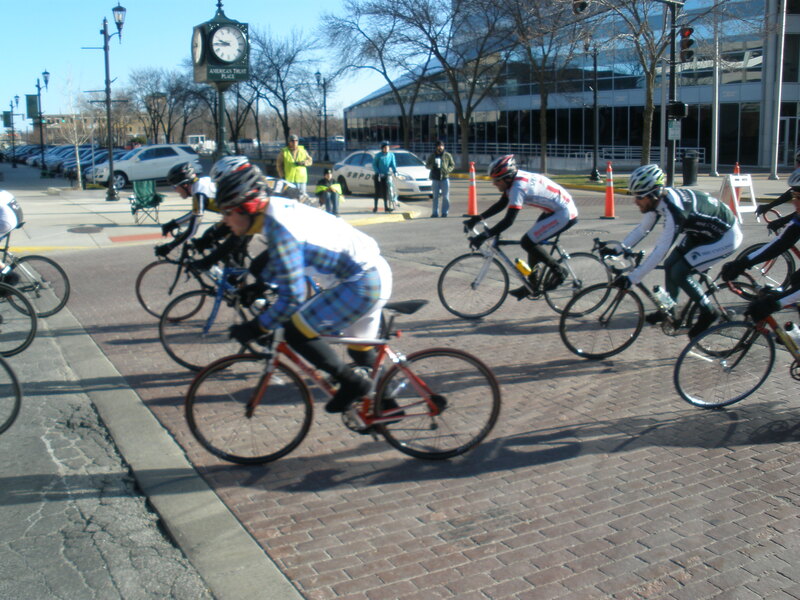 Boyle flatted out of the Men’s A race while Magro battled 30mph sustained winds to finish with the main pack. Although two race weekends remain on the conference schedule, ND has clinched a berth at the National Championships May 6-8 in Madison, WI. Races were a resounding success! Pictures, reports, and news articles all found here. Crit photos courtesy of Allan Blunt (Granger, IN) here Thanks Allan! Crit photos courtesy of Greg Furry here, thanks Greg! RR photos courtesy of Brian Pomeroy here, thanks Brian! 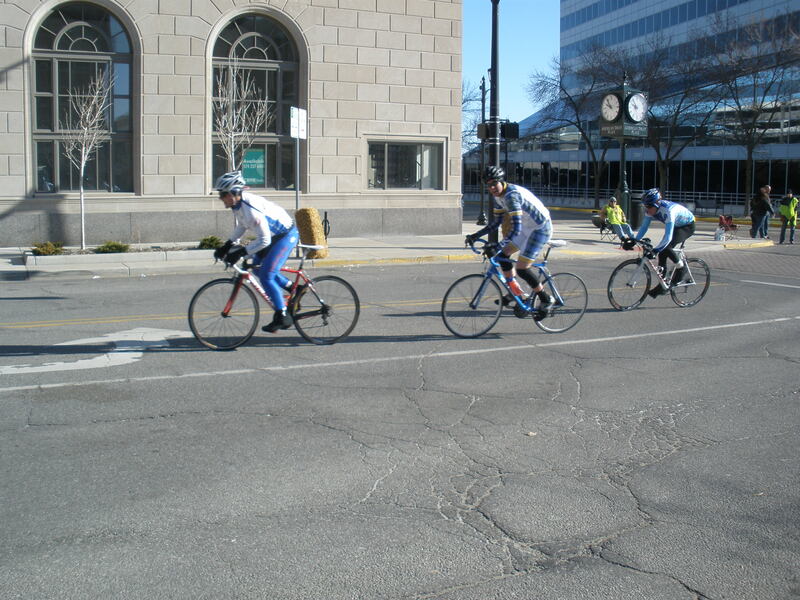 Bellefontaine OH – Road races Saturday were held on a rolling 15 mile course. 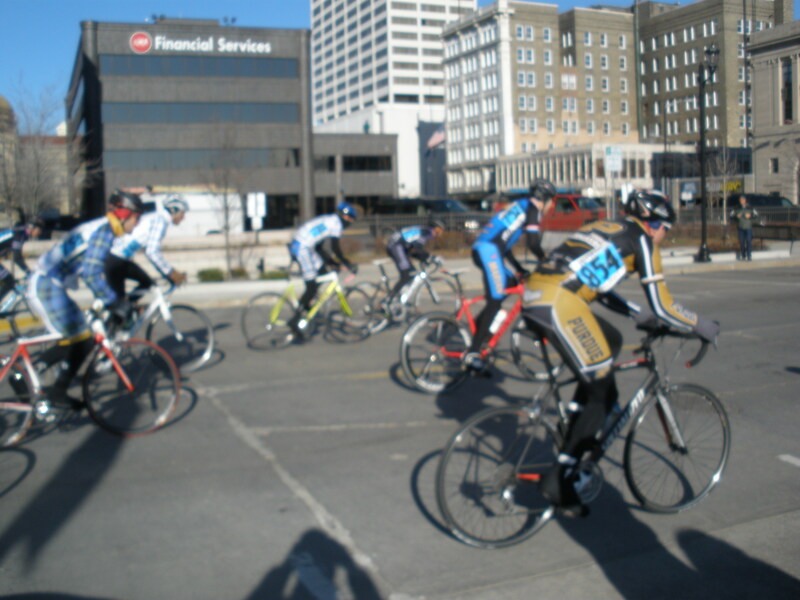 With weather quickly deteriorating and wind gusts near 30mph racers battled the elements as much as one another. Sophomore Brian Hurley, Men’s D, competed first for ND. 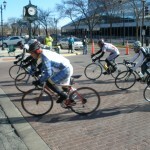 In his debut weekend Hurley rode well and finished 14th out of 51 finishers. Freshman Josh Corcoran, graduate student Andrew O’Donnell, and sophomore Michael Tonzi represented ND in the Men’s C field. 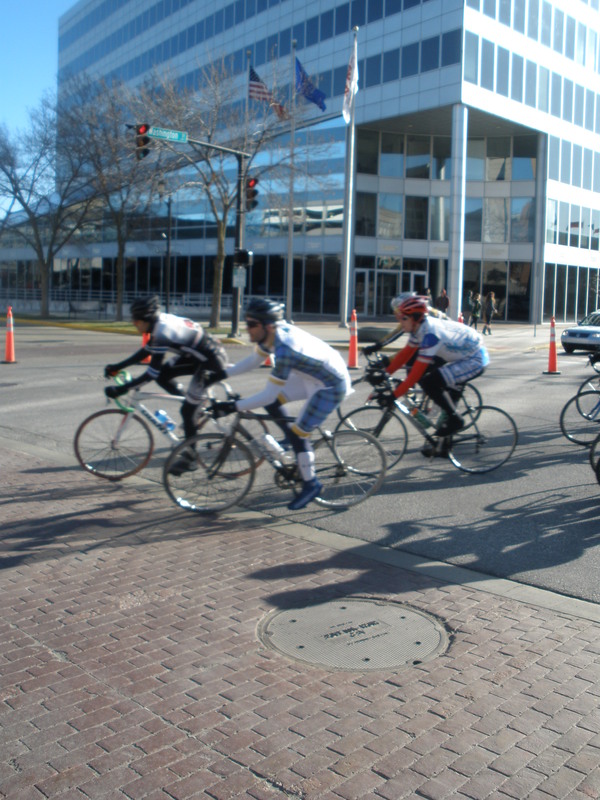 The race was fast from the gun as riders jockeyed for position heading into the first climb. O’Donnell and Tonzi were able to maintain contact with the leaders over the top and into the crosswinds on the plateau above. Still in a driving rain, Tonzi slipped into a pack of 4 as the main field began to fall apart 20 miles into the race. 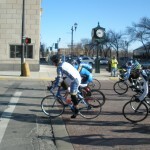 Sprinting for the finish, Tonzi crossed the line first in his group and 18th overall. O’Donnell wasn’t far behind while Corcoran also finished near the top half of the field of 60. 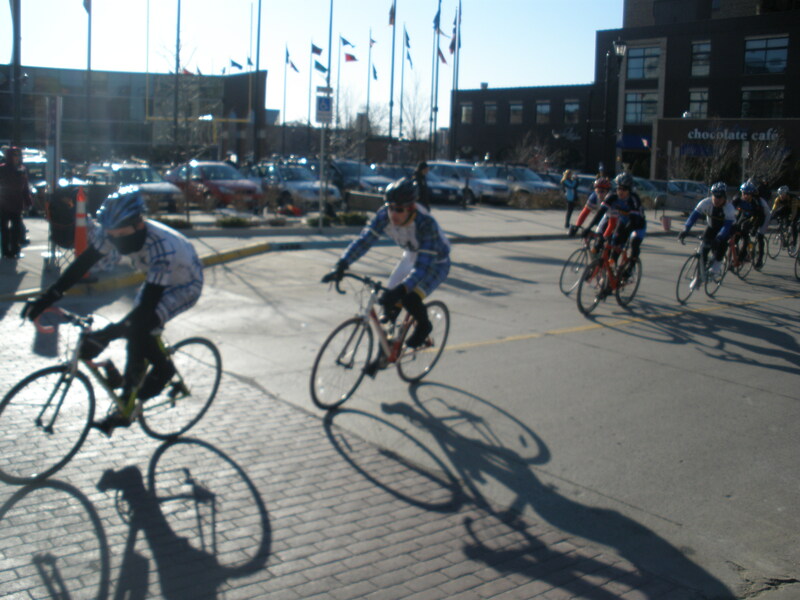 Graduate student Douglas Ansel and sophomore Joe Magro rode for the Irish in the Men’s A category. Much like earlier races in the day, an all out sprint to the first steep climb a mile into the course proved the defining moment of the race. Starting towards the rear, Magro passed much of the field on the ascent and crested the hill in the front group. As the temperature dropped into the 30’s and driving rain turned to sleet and hail riders strung out all over the course. 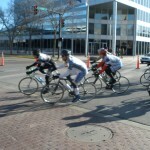 Crosswinds shifted to tailwinds 25 miles into the race resulting in sustained speeds of over 40mph. Magro settled into the second group of 8 and scored more nationals qualification points with 16th overall. 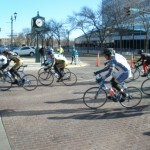 Snow and ice accumulation on the roads caused all Sunday’s races to be cancelled. Columbia KY – 45 riders were at the start of the 75 mile Men’s A road race in the hills of Columbia, KY. With 5 major climbs per 25 mile lap, Lindsey Wilson College’s course had been described as, “nothing like the rest of the courses in the conference.” by LWC cycling Coach Dave Grisby and set the stage for the beginning of the 2011 road season. Attacks began almost from the gun as both Marian University and Lindsey Wilson attempted to establish early breakaways before the road began to climb. Magro and Ansel both started towards the rear of the peloton as the field stretched into a long line with speeds touching 35mph. 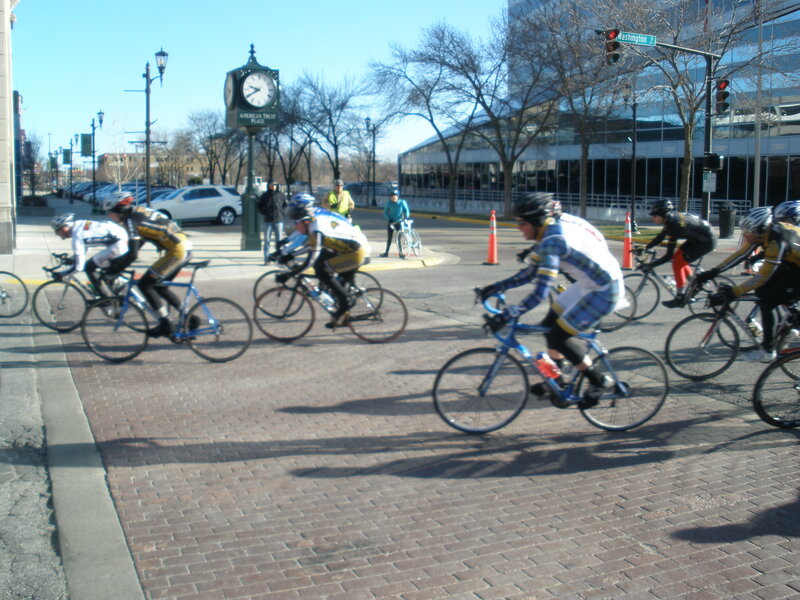 Midway through the first circuit a small break was able to distance itself from the field and the pace settled. With most of the major climbs located towards the rear of the loop, Magro and Ansel began to move forward in anticipation of attacks on the climbs. Maxwell Anderson of Wisconsin-Platteville paced the field up to the start finish line with Magro sitting right on his wheel and Ansel not far behind. Cresting the climb Anderson and Magro were joined by Naveen John of Purdue and Jackie Simes of Marian. The group was able to briefly escape before an effort from Lindsey Wilson college brought the field back together again entering the valley section of the course. Anderson, a DII rival, immediately attacked again and, 20 seconds behind, Magro was forced to lead the main field’s chase. Unable to bridge, and with little cooperation from Marian, the breakaway slowly pulled out of sight and Magro merged back into the peloton. Crosswinds on the plateau at the beginning of the second lap saw Ansel unhitched from the field, but he was able to return to the peloton midway through the circuit. Heading into the climb at the conclusion of lap 2, Magro again rode towards the front as the field shattered on the climb. Joseph Kukolla of Marian crested the hill with a 5 second advantage over Magro, Andrew Otte of Purdue, and Jackie Simes of Marian with the field a further 10 seconds back. Otte and Magro worked to reel in Kukolla and once together the group of 4 would not be seen again by the peloton. Slowly sweeping up the remnants of earlier breakaways, including Anderson, Kukolla, Magro, Otte, and Simes started the final climb of the day racing for 3rd. Magro paced the group up the kilometer ascent and dropped the DII Platteville rival. Content with finishing first in DII, Magro didn’t contest the sprint and came across the line in a career best 7th overall. Ansel finished soon after and also recorded a career best 13th place. AND THE WINNERS ARE THE GOLD TEAM! CONGRATULATIONS TO EVERYONE!